Melatonin is produced in humans by the pineal gland. A favorite of travelers, it helps support restful sleep. 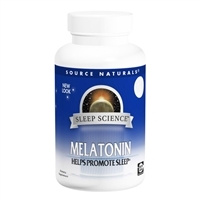 Source Naturals Melatonin Complex is a soothing nighttime formula, which combines the neurohormone melatonin with three key inhibitory neurotransmitters: GABA, glycine, and taurine; and coenzymated vitamin B-6, the active form of vitamin B-6. The sublingual form is absorbed directly into the bloodstream, via the blood vessels under the tongue, and in the cheeks, bypassing the liver and allowing for quick entry into the system.